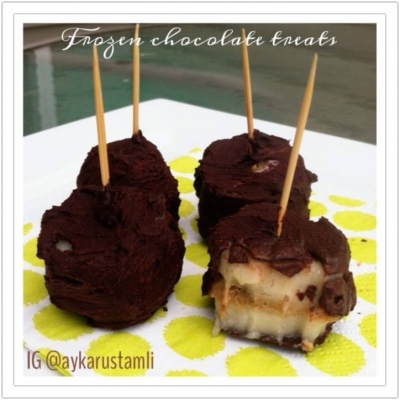 Want an easy and yummy frozen treat? Here ya go: cut half a banana into 10 circles. Now mix 1/2 tbsp peanut butter with 1 tsp honey and as much cinnamon as you like. Add in about 6-7 raisins and mix. Spread the mixture on 5 circles and cover with other circles. Insert a toothpick into each banana. Now place them on a parchment paper and freeze for an hour. An hour later cover them with the melted dark chocolate ( 75% or higher) and place back into the freezer for 10 min. Done. Enjoy. This is one serving.